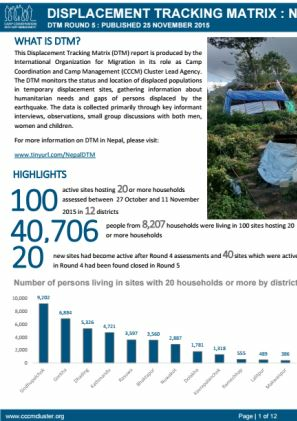 This Flood Displacement Dashboard created on 3 September 2017 shows the number of displaced individuals in Nepal. 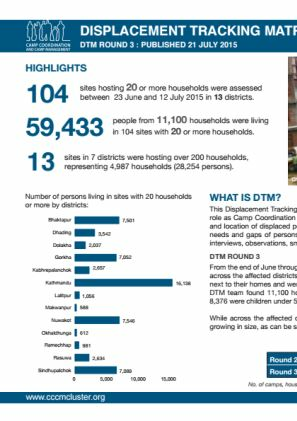 The DTM assessed 65 active sites hosting 20 or more households between 28 November and 10 December 2016 in 11 districts. 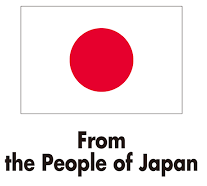 15,595 people were living in 65 sites. Since round 8 (25th July to 2 August 2016), 4 new sites had become active and 5 previously sites had closed. 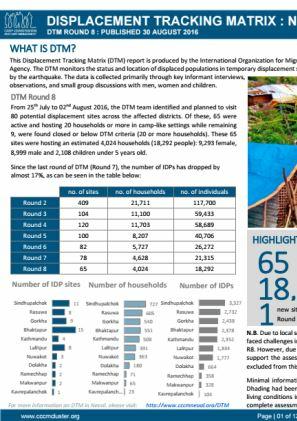 From 25th July to 2 August 2016, the DTM team identified and planned to visit 80 potential displacement sites across the affected districts. 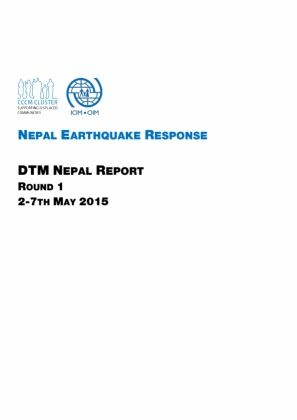 This is a collection of one national and 12 district profiles from DTM round 7. 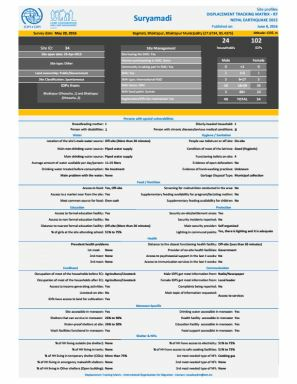 This is a collection of 78 site profiles from DTM round 7. 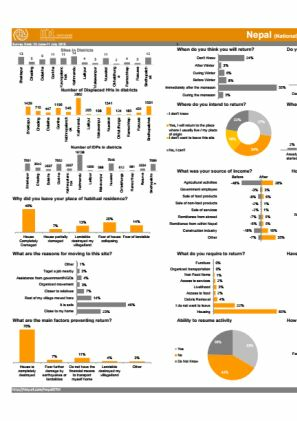 This report presents the outcome of the survey on return intentions undertaken in several cities in the country from 22 February - 4 March 2016. 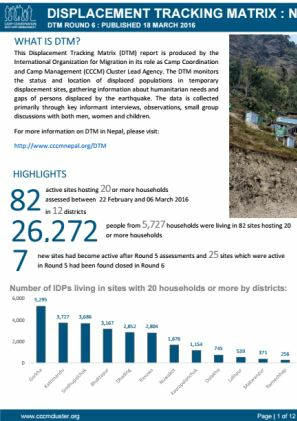 From 22nd February to 6th March 2016, the DTM team identified and visited 107 potential displacement sites across the affected districts. 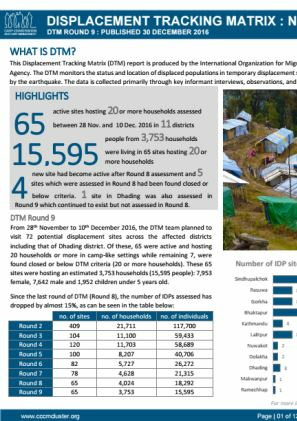 From mid-September through to 20 November 2015, the DTM team identified and visited 140 potential displacement sites across the affected districts. 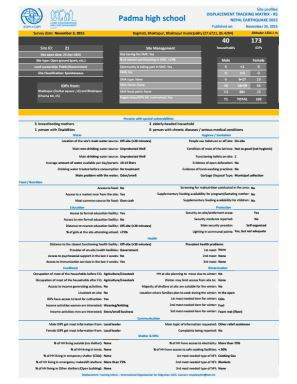 This document contains 12 district profiles and one national overview from Round 5 DTM assessments. 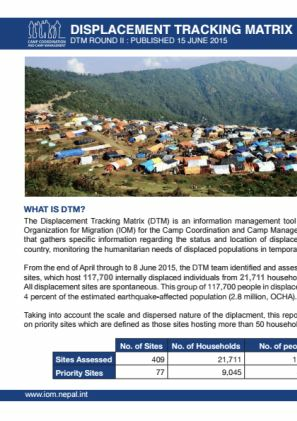 This document contains site profiles for 100 displacement sites identified in Round 5 DTM assessments. 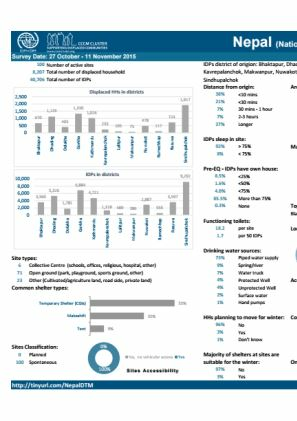 147 potential displacement sites across the affected districts were identified in Round 4 assessments. 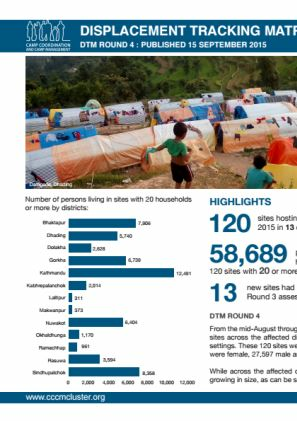 Of these, 120 were active and hosting 20 households or more in camp-like settings. These 120 sites were hosting an estimated 11,703 households (58,689 people). 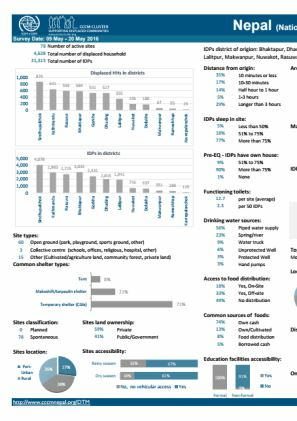 286 potential displacement sites across the affected districts were identified in Round 3 assessments. Of these, 107 were closed, 75 were hosting fewer than 20 households or dispersed next to their homes and were therefore not included in the assessments. 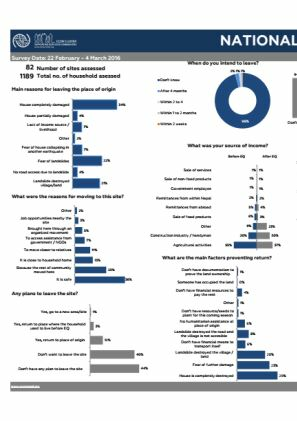 This report presents the outcome of the survey on return intentions undertaken in several cities in the country from 23 June - 11 July 2015. 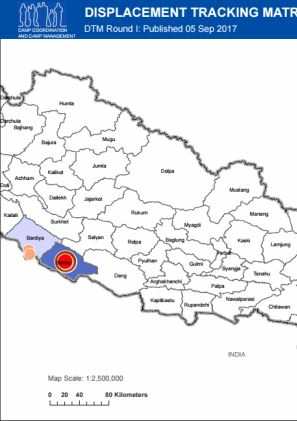 Round 2 assessments identified 409 displacement sites in fifteen earthquake-affected districts, hosting an estimated 117,700 people from 21,711 households. 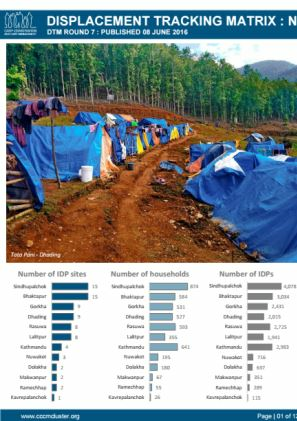 77 priority sites of more than 50 households are hosting 49,118 people. 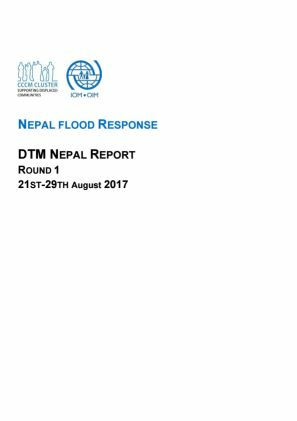 Round 1 assessments identified 5,783 IDPs in 53 sites in Kathmandu, Bhaktapur and Lalitpur districts. Sites are 98% spontaneous settlements and 2% collective centres.